Goodness Gracious, where to start! Lets start at the very beginning, which I am told is a very good place to start. I met Torry in high school, we both had a job at Cold Stone Creamery, which if you don't know is sort of an off the wall ice-cream shoppe, we sang, we danced, we were rowdy and it was a fun job to have in the early 2000's. Although I didn't know Torry outside of work I knew right away she was funny, and genuine, open and honest. We all had a great time together! At one point we even tried to make a music video. We were the realist ish out there. Fast forward a to last year! 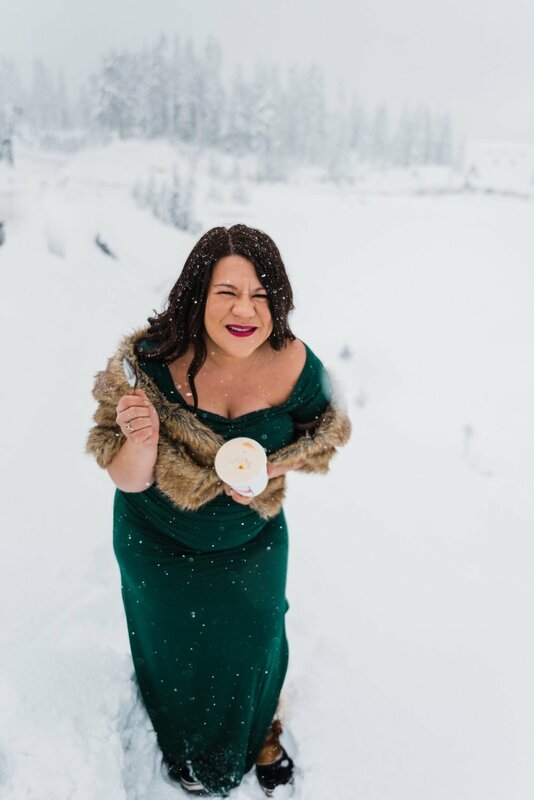 I was invited to be a part of a styled shoot up on mount baker and she was the lead coordinator. We reconnected over that day and have been working together since! We did a styled shoot last may at VanderVeen Farms there in Skagit Valley (Check out the blog) and I can tell you, she hasn't changed since highschool, She's still an amazing human with a vision and is such a great person to have on your team for your big day or event. 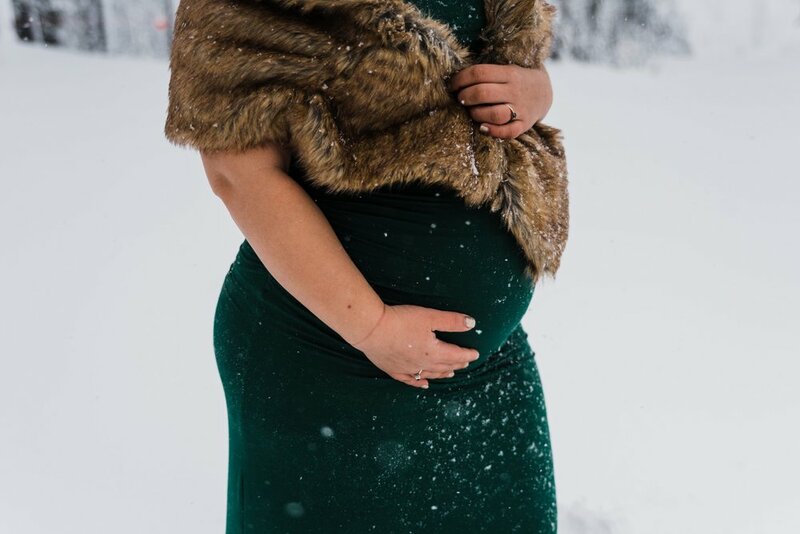 When Torry Told me she was pregnant, I floated the idea by her to do a snowy maternity session and she was ALL IN. We left my house early morning only to drive straight into a blizzard. I wouldn't have it any other way! We managed to find a sheltered spot where we took some BEAUTIFUL photographs of mama and her little baby bump Oscar Bennett, pause for a moment how cute is that name???! 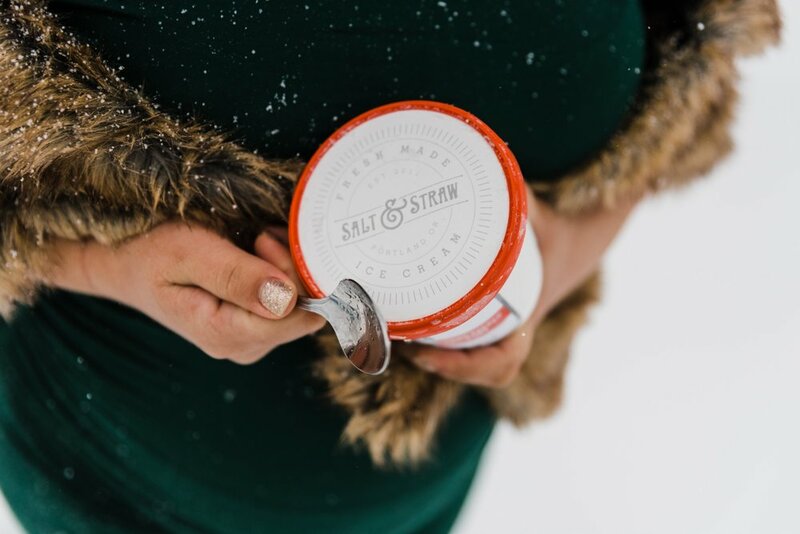 Torry even brought ice-cream that was shipped to her from Salt and Straw. This batch was apricot and oh my gosh! It was even better than Cold Stone (am I allowed to say that? 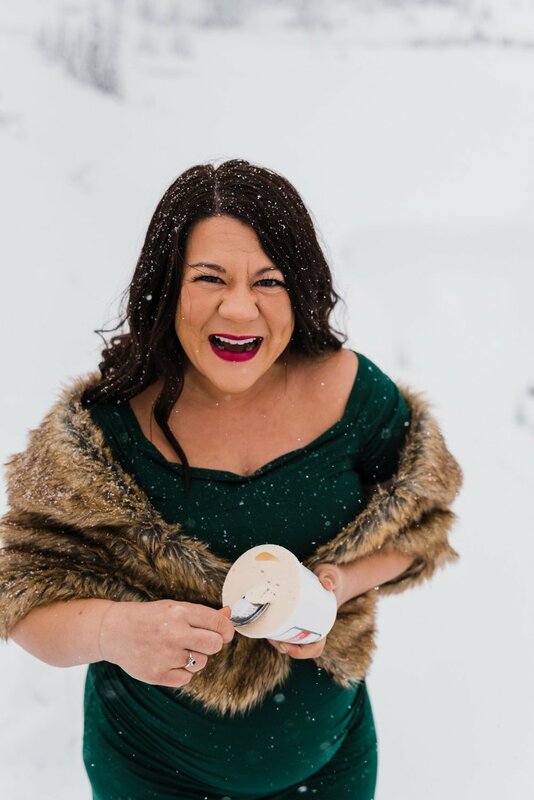 I feel like I am cheating) They seriously do amazing things with their icecreams, and they send out pints on dry ice each month in their monthly subscription boxes. Even after driving ALL day the ice cream was perfectly hard and delicious. 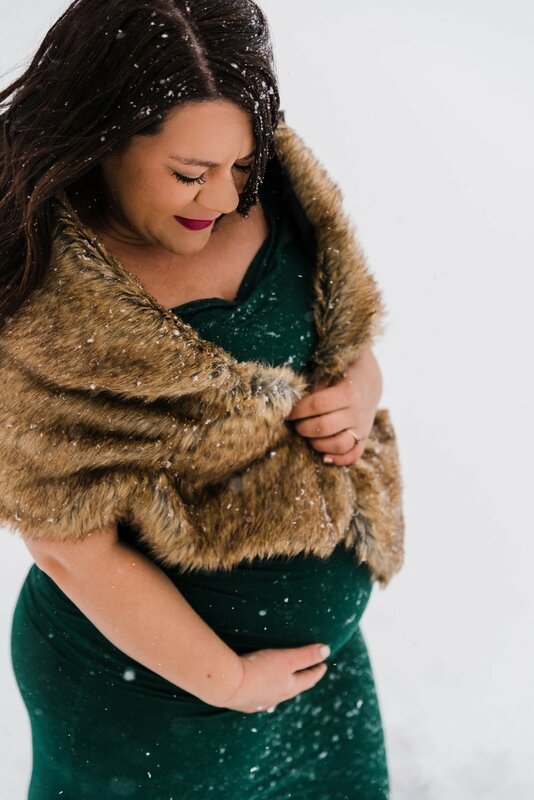 Torry was a vision in her green dress, and faux fur shawl! I never EVER liked the look of fur. It just screamed cheesy 80's style to me, but these last few years I have found it to be just the right pop of texture in some cases. On our way down the mountain I pulled over to one of my favorite mossy covered spots to take just a few more photographs and let me tell you, The whole day was absolute MAGIC. 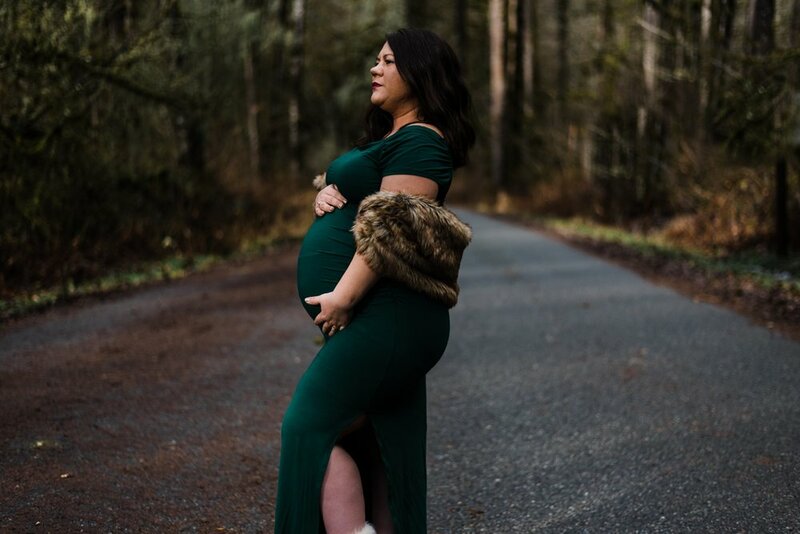 Torry thank you for letting me adventure you around Whatcom County, and I cannot wait to meet your little nugget!